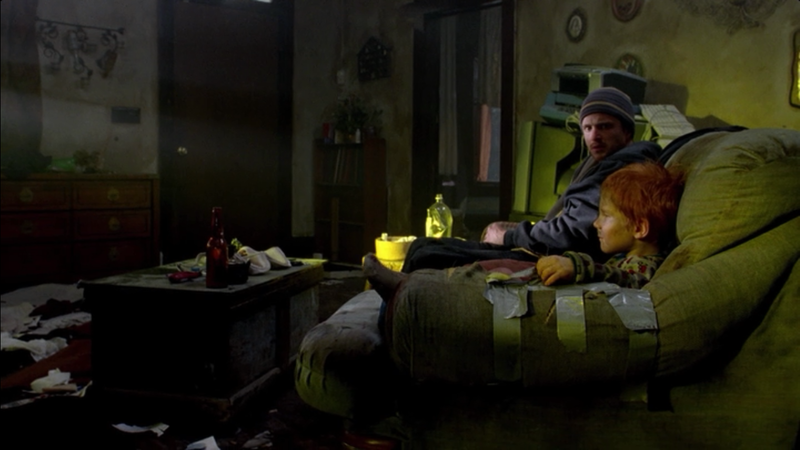 PEEKABOO: Abjection in Breaking Bad. In this episode of Breaking Bad (S2EO6), Jesse goes in search of the people responsible for stealing the drug supply of one of his friends and partners, Skinny Pete. He finds himself in a home that can hardly be considered livable that belongs to two meth addicts. It is obvious to him, as well as the audience, that whoever lives in this home is not someone who cares deeply about cleanliness and quality of life. A little boy comes out and begins to watch television, and immediately a look of horror dawns on Jesse’s face. In this moment this house becomes- in a sense- a “corpse.” It reminds him, and the audience (who see the events from his perspective), what he “permanently thrust aside in order to live” (Kristeva, 3). His job, up to this point, has been making and selling meth, as well as taking the drug himself from time to time. The house becomes this source of abjection, reminding him of the side of his business that he did not want to think about before. For the most part, Jesse has chosen to focus on the money and easy living that comes with cooking meth, but this house unveils to him the destruction, addiction, and death the also results from it. This border has been established between the myth of meth and the reality, or between the dealer and the consumer. When it is crossed (represented by Jesse as he climbs inside the house), it becomes the abject, bringing about “an encounter between the symbolic order and that which threatens its stability” (Creed, 253). Jesse, through his encounter with the young boy, sees just what happens on the consumer side of the business. The boy is covered in dirt, hungry, and has no one to make him anything to eat, and is stuck in a dirty house watching the news. When the parents get home, it is even worse for Jesse, as he, along with the audience, can see that the parents are loud, violent, and more focused on drugs than they are on their own child. He, at one point, tries to tell them to take better care of their child. The response he gets is far from desirable, as the mother just says, “give me one hit and I’ll be the kind of mother that you want.” For Jesse, “the clean and proper becomes filthy, the sought-after turns into the banished, fascination into shame” (Kristeva, 8). Jesse, even though he is not a parent, can see what is wrong with the situation in front of him, and recognizes that it is because of meth that the boy’s life is the way that it is. What he saw before as a way to make money morphs into this filthy idea that has consequences beyond just conflicts with other dealers. The parents in this house represent “death infecting life” as they are manifestations of the effect drugs can have on a person’s life (Kristeva, 4). And the audience, like Jesse, cannot look away from this bad situation. In this way it is similar to a horror film. For Jesse it is as if he is seeing a “corpse” or a reminder of the effects of his work and also his own materiality. He can see how easily he could fall from using and also how it could affect others. For the audience, even though what is being seen on screen could make someone sick, by watching, it “signifies [for them] a desire for perverse pleasure…but also a desire…to eject the abject” (Creed, 253). P.S If you can’t tell from the above GIF, Jesse Pinkman is an angel. Though I have never seen Breaking Bad, I do have a cultural awareness of the show’s premise. You did a fabulous job of making your argument relatable even to those who haven’t seen the show. I think that your analysis of how Jesse comes to feel the weight of the abject is especially powerful. I wonder however if what he is confronted with is slightly different than abjection; by this, I mean that “abjection is elaborated through a failure to recognize its kin” and I think what he finds in the young child is just that (Kristeva 5).